If you have never experienced the grandeur of a Tim Rice & Andrew Lloyd Webber collaboration, now might be a good time.. 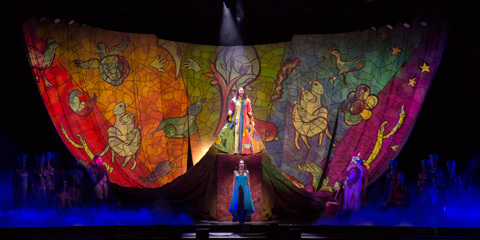 The first of Andrew Lloyd Webber and Time Rice musicals to be performed publicly, Joseph is based upon the “coat of many colors” story in the Bible Book of Genesis. It is also a sung-through musical, having few to no words..the story being relayed through the lyrics in the songs. This new production is directed and choreographed by Tony Award Winner Andy Blankenbuehler, and features television/Broadway star Diana Degarmo (who rose to fame in 2004 as runner up in the third season of American Idol) as The Narrator and Ace Young (Grease/Hair) portraying Joseph. A beautifully told story for all members of the family. Of note: Hershey Theatre policy is that each patron of the theater must have a ticket, no matter what age. One person per seat.